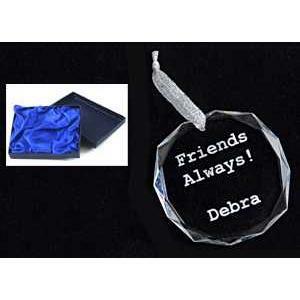 The highly polished Optic Crystal Ornaments are a beautiful way to preserve sentiments, yearly milestones and memories. Each Ornament arrives in a beautiful satin-lined gift box completing the luxury of this gift. Laser engraving reveals a frosty white tone for excellent contrast. Ribbons included!